July 12. It started with the Concord Xerxes Count. Before today Renee and I had never seen a Harvester (Feniseca tarquinius), but today Renee, Maria, Steve and I discovered this beautiful little butterfly in Acton. A first for the Concord Count, and I took this photograph as proof. We were thrilled, especially since it is so uncommon. July 22. I got an excited call from Renee. "Harvester! Across the street from my house!!" Over the next few days Renee checked constantly, but late afternoon seemed the magic time, and always on the same elm leaf. July 26. I joined her this afternoon, and as we were watching the Harvester it flew high in the air and a second one joined it and they dueled midair, then came down again, each settling on a separate elm leaf. But as we were leaving, I noticed an orange spot on a poison ivy leaf nearby. A third Harvester! July 28. Over the next few days we continued to watch them, and started to recognize individuals, like the notched-winged individual on the left, surely the same as the one shown above. Today, however, it was perched on the poison ivy leaf. They definitely had three favorite perches: the two elm leaves and the poison ivy leaf. Male Harvesters sit in the afternoon sun to wait for females to notice them. It's interesting that these perches were so desirable that they would use another's perch. Could there be a benefit to using a perch previously used by another male? Perhaps combining pheremones with another male makes them more desirable. July 31. Renee had a total of five butterflies today! I took these photos today, and as you can see, the individual on the right is already extremely worn. We suspect it is not one of the original three, and the one on the left seems too fresh. August 21. Renee had been looking for aphids for weeks, and although she found them on many other plants she couldn't find any on alders until now. Today she found seven Harvesters. August 22. Renee discovered the first caterpillar! August 23. A second caterpillar. But the aphids are gone here, so Renee and I decided to move them to another branch of aphids. They don't like being moved, and wouldn't cling. One even fell into the lake at one point. We finally got them in place, but felt guilty about messing around with them. August 25. Caterpillars are gone. But two butterflies seen landing on aphids. Ovipositing? August 28. I decided to spend some serious time looking for Harvesters - I hadn't seen more than four at a time, and I wanted to catch up with Renee's seven. In the "regular" place I found five, but then I checked a spot where Renee had discovered a fair number of aphids. There must have just been a big hatch because in that location alone I found thirteen Harvesters, all fresh, and as many as four in the air at once - a total of eighteen for the day. Many were flying very low, as if they were about the land on the gravel path, but when they did land it was on a low leaf. The next day Renee and I looked, but we could only find a small number. September 1. The last day either of us saw a butterfly - Renee saw a single in the "new" place. September 11. Renee had been watching five or six caterpillars, but most of the aphids at this spot had disappeared, leaving us worried about what would happen. September 13. The aphids were gone, and only one caterpillar remained, so Renee collected it and went in search of aphids. She found three and was delighted to see the caterpillar eat one. Phone conversation: Me: "Hey Renee I'm on my way over with a present for you." Renee: "A present, what? . . . Do you have aphids??!!!" Me: "Yup." Renee: "Oh fantastic, I'm so excited!" How many people do you know who get excited about a gift of aphids? September 16. Exciting news! The aphids I had brought contained more caterpillars. Renee discovered a total of 6 large and 4 small caterpillars. She gave me her pupa plus two large and two small caterpillars. September 17. I had collected some aphids, but the they were the winged type, apparently not desirable, and the two smaller caterpillars disappeared. The two larger ones humped into a pupa shape in the morning. September 18. One of the larger ones pupated around 3PM when I got home, and I photographed it immediately (left). By 8PM it had developed more and I photographed it again (right). The second caterpillar had pupated and looked like the photo on the left. September 22. Renee's larger caterpillars pupated at the same time mine did, but the smaller caterpillars had disappeared, and Renee figured they must have died since the aphids were gone. But today she discovered they had pupated! Note the difference in size between the two chrysalises on the left (the smaller pupa from the smaller caterpillar). My three chrysalises are on the right. We wonder if the lack of a food supply forced pupation before the normal instar. Can't explain it any other way. So, Renee now has 4 large and 2 small pupae, I have 3 for a total of 9. We await the spring. October 2. I guess I thought the story was over for the year. Brian Casse had told me he thought they would eclose, but it was September - how could they possibly try for another generation! But Brian was right. On September 30 it had been 12 days since the last caterpillar pupated, and I had pretty much decided they were there for the winter. I was keeping them on an unheated porch with the door open. There was plenty of natural light and I figured that was as close to "natural" conditions I could simulate. On October 2 I hadn't checked the chrysalises for two days, so when I got home at 5PM I did a quick check and there were two butterflies (the two that pupated September 18). 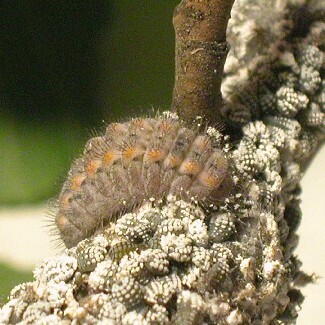 The remaining pupa is the original and may be dead. I had no idea when they hatched, and they both looked pretty lethargic. If they had hatched two days ago and not had any food I don't know what impact that would have. I called Renee but there was no answer, so in the waning light I hustled them over to where the caterpillars were collected and released them. Neither was willing to cling to the low leaf I tried to put them on, but I didn't know what else to do. I saw Renee's car, so dropped in to see how her chrysalises were doing. Like me, she hadn't checked for a while so we took them out to look them over. First we checked out my empty chrysalis cases, then looked at her chrysalises. The larger ones (also pupated September 18) were very dark, and the smaller ones still "monkey faces." Looking at the dark pupae, they appear to be turning transparent, and the "cheek" appears to show an orange wing (?). October 5. E-mail from Renee: "When I got up at 7:00 this morning I found that one of the Harvesters had hatched. There is a spot of pale pink liquid below where it is perched on the side of the container." This is something I had not observed with my butterflies. Phone message from Renee - "Two more Harvesters. They weren't out when I left at 12:30, but when I got back at 2:00 they were butterflies. Sure wish I'd seem them come out." Seventeen days from putation to eclosure. Seems a long time for a butterfly with a three-week life cycle. October 10. Renee and Dave are going away for the weekend, so I am babysitting the three remaining ("small") chrysalises that pupated on September 22. October 11. When I left home in the morning there were three chrysalises, two of them dark. When I got home, there was one butterfly. I jumped back in the car with the jar, and drove to the harvester place. I removed the gauze from the bottom of the jar with the butterfly attached, and tried to ease it onto a leaf. It climbed onto my thumb instead, and I waited for a few minutes, then it flew into the air and disappeared. 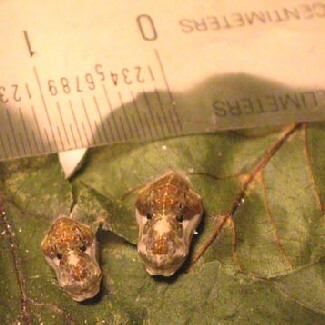 Below on the left the empty pupa case, in the center the second dark one, on the right the pupa does not look ready to eclose. October 12. Pouring rain all day, and I spent most of the morning working at my computer. Every once in a while I'd glance at the dark pupa and try to imagine it was getting darker or moving. Went out for lunch, and when I got back at 2:30 the chrysalis was empty (looking like demon mask) and the butterfly was crawling all over the glass of the container. It was much to wet to try to release it today, so I waited till tomorrow for fair weather. October 13. When the day had warmed up, I took the container to the Harvester place and opened the top. Eventually it climbed up to the rim, and I took pictures of its first moments as a free butterfly before it took off. It flew - only inches - to the viewfinder of my camera. I had my other camera with me and took this photo seconds before it flew high into the air and disappeared. September 1 Renee finds only 1 butterfly - the last of the year except for releases. September 13 Renee collects caterpillar #1 from the branch; I bring aphids for food. September 16 Renee has six large (batch #2) and four small (batch #3) caterpillars left. All the aphids are gone, and both of us think batch #2 are pupating and batch #3 cannot be found. September 18 My two #2 caterpillars pupate. One of Renee's #2 caterpillars pupates.